It all began in 1998 for HT-SAAE Solar Panels, and they have built up to a Global Fortune 500 company also. They have over 19 years in solar, in fact has an ultra modern factory in China. They make the panels complete from the silicon wafers and also all the way through to the finished product. Due to this and great panels, as at Q1, 2018 HT-SAAE sits 16th on the Bloomberg Tier 1 manufacturers list. Now one of the most successful panel makers, it also has over 3GW of solar installed globally. Further Powerark Solar helps with all the support for HT Solar Panels in Aussie. The current HT-SAAE model is specifically the HT60-156P 265 watt panel, and its one of the best for the money. Also one of our most popular low cost, Tier 1 products, above all it has the features that people want. The HT-SAAE sells well as its a big hit, being that it suits those not wanting to spend mega bucks. To sum up, that sounds like something that most of us want! You could say in fact that the HT-SAAE panel is just like any other high quality solar panel. With these panels, the angles and mitres all fit snugly, and also the connections and cabling do too. The 35mm frame feels quite firm, and the overall appearance looks as though the quality control systems are working well. Like many panels on the market there is a 10 year panel and also a 25 year output guarantee. So if you need help with your HT-SAAE panels, this provided by Powerark, who have an office in every state. 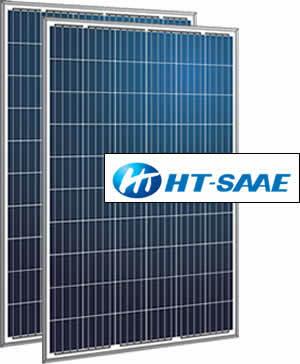 HT-SAAE Solar Panels Review Our Rating - all in all - Very Good. These panels cost less than other bigger, better-known panel brands. They are not the cheapest panel in fact, by any means and are a true Tier 1 product. They are a great choice when dollars are tight but good quality essential. Check Our Solar Panel Deals! Stop paying big $$$ to your power company!